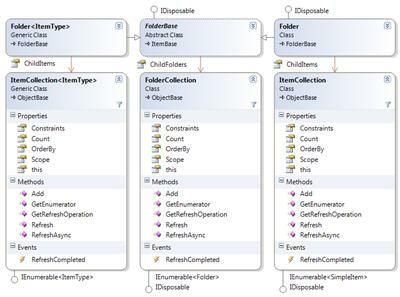 New class SearchResult, which is used in the Methods.Search method. It contains the result items of the search, as well as the total number of items of the search. Well, turned out that it was all wrong. It was my virus scanner.... Which is rather curious, because all I had activated was the filesystem scanner - network scanning was deactivated... But when I deinstalled it, the symptoms disappeared instantly. Anyway - now I have to find a new virus scanner which doesn't break .NET applications. Wow - that was fast. I opened a support incident at Eset, the creators of NOD32, and within one hour, they responded to my question. The solution is to reinstall NOD32, but disable the IMON feature all together. The support technician told me that this feature will be removed in the next version completely, because of this very reason. So, no need to get another virus scanner. This is a console application, so you'll just have to replace the main class of a newly created console application with this code. Then, add a reference to my library (At least version 0.99.2). You'll probably wonder why I used the MAPI property 0xe1b00b instead of the urn:schemas:httpmail:hasattachment property. In the past, I've found the latter property not very reliable - it was false, even though a message had an attachment. And since I'm using a non-standard property here, I have to cast it to boolean to make the request work. If you don't do this, you'll end up with a Bad Request error from exchange. I will post an example tomorrow on how to use these new methods to enumerate the attachments of all items in the inbox folder of a users mailbox. 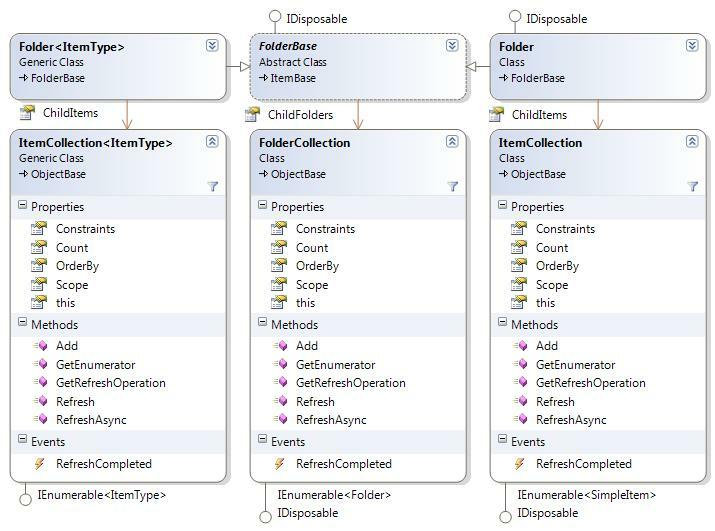 New class FolderCollection, which provides access to subfolders of an item. The Folder class now has a property ChildItems. All Item and Folder classes now expose a method ResetSecurityDescriptor and ResetSecurityDescriptorAsync, which does exactly that. Upgraded the threading library to version 2.5.2. This fixes a bug with all the synchronous methods blocking in a deadlock. I've just uploaded this new layout... didn't like the old one any longer. There are a few bugs with this design an IE 6... I will fix them in the next few days. But Firefox 2 and Internet Explorer 7 are ok.
A while ago, I posted an article on how to create managed event sinks. This is a follow-up on that article covering application settings. Normally, application files are named after the .EXE file which hosts a managed component: An .exe file called myapplication.exe has a configuration file of myapplication.exe.config which resides in the same directory as the myapplication.exe file. There are two issues when dealing with Exchange event sinks: First, the working directory is %systemroot%\system32. And second, the executable host is svchost.exe. With .NET 1.1, the only option here was to create a svchost.exe.config in %systemroot%\system32. Bad days for those with more than one managed COM+ application on one server. 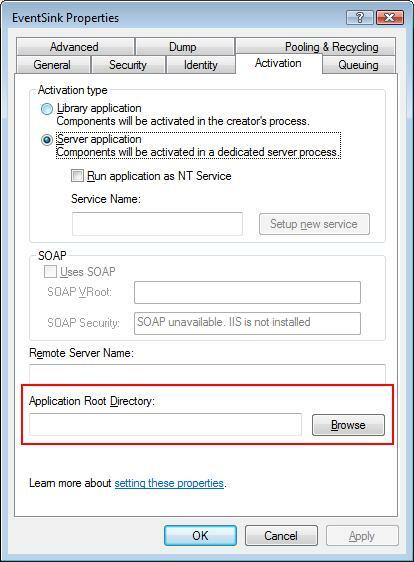 Now, you must reconfigure your COM+ application to set the working directory to the directory where your COM+ DLLs reside: Open Component Services, navigate to your applicatoin and open the properties. Activation propertysheet in component services (click to enlarge)In the text box Application Root Directory, specify the path your event sink. Here is a small update on my multi threading framework. After some background reading on how the BackgroundWorker synchronizes event invocations, I decided to implement a similar functionality into my framework as well. The Background worker allows updates to the UI without the need to call Control.Invoke. It does this by utilizing the SynchronizationContext class (A good article on this topic can be found here on CodeProject). This version of my multithreading framework also uses this mechanism to call the Completed, ProgressChanged and Error events. And best of all, this is agnostic to the UI framework used: It works with Windows Forms as well as Windows Presentation Foundation. Another issue you should know when working with my framework is this: You must never return a NestedOperation or a ParallelOperaton from within a region protected by either a Monitor (explicitly or via the lock (SyncLock in Visual Basic) keyword) or a Mutex. This is because these synchronization primitives are thread-dependent. Use a Semaphore instead. The code from line 3 through line 16 are protected by a Monitor to ensure that the code is not executed twice (which could hapen when the method is called in parellel). In line 12, a nested operation is executed, doing the hard work. But when the displayed method is resumed in line 13, the code may run on a different thread than before. This will cause the Monitor.Exit (which is implicitly called in line 16) to throw a SynchronizationLockException. To avoid this, use a Semaphore instead. Events are now called via a SynchronizationContext. This makes the usage of Invoke() methods unnecessary when reporting progress to Windows Forms or WPF applications. This is a minor update on the InfiniTec.Exchange library due to the issues found within the multi threading library today. The Example application has also been updated accordingly. Fixed a multi-threading bug in the ActiveDirectoryResolver class. Upgraded the threading library to version 2.5.1. It's no longer necessary to call Control.Invoke() methods when reporting progress to the UI. This is a major upgrade for my multithreading library. If you are not familiar about what this library does, please read the other articles in this section. New in this release are parallel operations: You can return ParallelOperation from within an asynchronous operation. The execution of the current operation will be suspended until all nested operations are executed. Additionally, a maximum number of parallel executions can be passed along, which allows you to further control the execution of the nested operations. And of course, you can select which exceptions you want to catch on each of the nested operation. In Line 9, I call the original refresh method, using the NestedOperation operation action. After that, I decode those member entries in lines 22 to 27 and put them in a dictionary. The interesting thing happens in line 29. At this point, I return a ParallelOperation operation action with a list of those member references. Additionally, a maximum number of concurrent operations of 5 is specified. When the method resumes it's operation in line 31, all nested operations have been completed. Introduced parallel operations: Using the ParallelOperations action, you can now return multiple nested operations which will be executed in parallel. Once all nested operations are finished, the parent operation is resumed. The AsyncOperation<StatusType> can now also be used to return a result. Just return an OperationResult<StatusType> in the enumerator. Again, an update on my exchange library. This update fixes a bunch of issues (many thanks to Mr. Heinen for his input), and some new features, as listed in the change log below. This release adds experimental support for distribution lists in exchange folder. But instead of relying on the OWA commands to decode them (as described here), I decoded the binary member properties. Turned out, that the entry ids contained in that folder can be translated into a permannt url. This release allows only read-only access to the member list. User - A reference to an Active Directory user. EmailAddress - A so called One-Off member. This is just name with an email address. When giving other people access to a calendar folder on a mailbox, it's not enough, to set those permissions on the calendar folder itself. The trustee must be given access to the local free busy data as well (This folder resides in the NON_IPM_SUBTREE/FreeBusy Data folder). The Mailbox class now returns a special folder instance for the mailbox.Calendar folder which handles this. More information on this topic can be found here. Connection class now implements IDisposable (explicit implementation) and has a Close() method. Call either of these methods to close the underlying active directory connection. Optimized the resolution of mailbox urls. Added DistributionList class, which provides read-only access to the members of a distribution list stored on an Exchange folder. Added new CalendarFolder class, which is returned from the Mailbox class. This class propagates security changes made to the folder to the local free/busy folder, as described in KB (237924). See http://support.microsoft.com/kb/237924/en-us. Fixed a bug in the save method which occured when the Save operation was called when no properties were changed. New Class WellknownContentTypes, which has some definitions of common content types. Removed the SearchScope property from the SearcherBase class, as it was redundant. Use the Scope property instead. All-in-wonder package, including source, binaries, documentation and example application.